This might seem like the most elemental of ideas, but for me, the first important principle is simply: Pair great with great, humble with humble. A hot turkey sandwich doesn’t need a pricey Merlot to accompany it. On the other hand, an expensive crown rib roast may just present the perfect moment for opening that powerful, opulent Napa Valley Cabernet Sauvignon you’ve been saving. Second, match delicate to delicate, bold to bold. It only makes sense that a delicate wine like a red Burgundy will end up tasting like water if you serve it with a dramatically bold dish like curry. Dishes with bold, piquant, spicy, and hot flavors are perfectly cut out for bold, spicy, big-flavored wines. Which is why various shirazes are terrific with many “hot and spicy” cuisines. Think about a wine’s flexibility. Although Chardonnay is wildly popular in many parts of the world, it’s one of the least flexible white wines with food. Chardonnays often have so much toasty oak and high alcohol that they taste hard and dull when accompanied by food. For maximum flexibility, go with a Sauvignon Blanc or a dry Riesling, both of which have cleansing acidity. 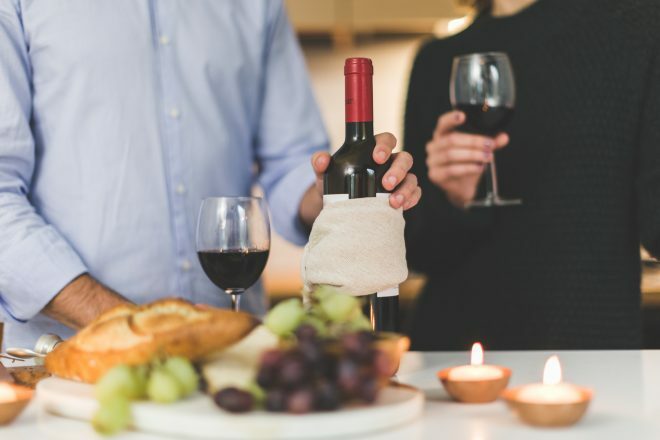 Wines with high acidity leave you wanting to take a bite of food, and after taking a bite of food, you’ll want a sip of wine. The perfect seesaw. So there they are, a group of pretty simple principles, meant only as a guide. The real excitement is in the experimentation, and only you can do that.